Why Did World War II End? There has long been a scholarly debate about whether it was necessary for the United States to use atomic weapons to bring World War II to an end. Traditionalists say yes: If not for Fat Man and Little Boy, Japan would have fought to the last man. But revisionists argue that by August of 1945: (a) Japan’s situation was catastrophically hopeless; (b) they knew it and were ready to surrender; and (c) thanks to decoded Japanese diplomatic messages, Harry Truman and other American leaders knew they were ready. A Japanese surrender could have been negotiated in fairly short order with or without the destruction of Hiroshima and Nagasaki. For various reasons I’ve always found the revisionist view unsatisfactory. After all, even after the Hiroshima bomb was dropped, we know there was still considerable debate within the Japanese war cabinet over their next step. Surely if Japan had already been close to unconditional surrender in early August—and for better or worse, unconditional surrender was an American requirement—the atomic demonstration of August 6 would have been more than enough to tip them over the edge. But it didn’t. It was only after the second bomb was dropped that Japan ultimately agreed to surrender. August 6: Hiroshima bomb dropped. August 8: Soviet Union declares war on Japan and invades Manchuria. August 9: Nagasaki bomb dropped. August 10: Emperor Hirohito breaks the cabinet deadlock and decides that Japan must surrender. According to his close examination of the evidence, Japan was not poised to surrender before Hiroshima, as the revisionists argued, nor was it ready to give in immediately after the atomic bomb, as traditionalists have always seen it.…Americans, then and today, have tended to assume that Japan’s leaders were simply blinded by their own fanaticism, forcing a catastrophic showdown for no reason other than their refusal to acknowledge defeat.…But Hasegawa and other historians have shown that Japan’s leaders were in fact quite savvy, well aware of their difficult position, and holding out for strategic reasons. Their concern was not so much whether to end the conflict, but how to end it while holding onto territory, avoiding war crimes trials, and preserving the imperial system. The Japanese could still inflict heavy casualties on any invader, and they hoped to convince the Soviet Union, still neutral in the Asian theater, to mediate a settlement with the Americans. Stalin, they calculated, might negotiate more favorable terms in exchange for territory in Asia. It was a long shot, but it made strategic sense. On Aug. 6, the American bomber Enola Gay dropped its payload on Hiroshima.…As Hasegawa writes in his book “Racing the Enemy,” the Japanese leadership reacted with concern, but not panic.…Very late the next night, however, something happened that did change the plan. The Soviet Union declared war and launched a broad surprise attack on Japanese forces in Manchuria. In that instant, Japan’s strategy was ruined. Stalin would not be extracting concessions from the Americans. And the approaching Red Army brought new concerns: The military position was more dire, and it was hard to imagine occupying communists allowing Japan’s traditional imperial system to continue. Better to surrender to Washington than to Moscow. In some sense, the real answer here is probably unknowable. Two events happened at nearly the same time, and they were closely followed by a third. Figuring out conclusively what caused what may simply not be possible. Probably they both played a role. Still, aside from the documentary evidence that Hasegawa amasses, his theory accounts for other aspects of the war. Like the dog that didn’t bark in the night, Japan didn’t give up after the fire bombing of Tokyo. Nor did Germany surrender after the fire bombing of Dresden. 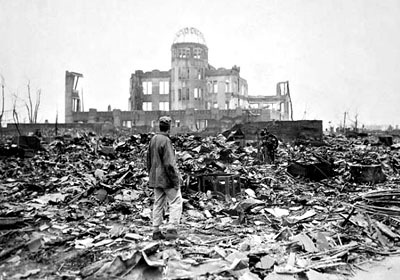 And although it’s undeniably true that atomic bombs are a more dramatic way of destroying a city than conventional weaponry, it’s also undeniably true that simply destroying a city was never enough to produce a surrender. So why would destroying a city with an atomic bomb be that much different? This is fascinating stuff. At the same time, I think that Cook takes a step too far when he suggests that Hasegawa’s research, if true, should fundamentally change our view of atomic weapons. “If the atomic bomb alone could not compel the Japanese to submit,” he writes, “then perhaps the nuclear deterrent is not as strong as it seems.” But that hardly follows. America in 1945 had an air force capable of leveling cities with conventional weaponry. We still do—though barely—but no other country in the world comes close. With an atomic bomb and a delivery vehicle, North Korea can threaten to destroy Seoul. Without it, they can’t. And larger atomic states, like the US, India, Pakistan, and Russia, have the capacity to do more than just level a city or two. They can level entire countries. So, no: Hasegawa’s research is fascinating for what it tells us about a key event in history. But should it change our view of atomic weaponry or atomic deterrence? I doubt it. It’s not 1945 anymore.